Next to the city hall of Mijdrecht you come together at Rendez Vous for an honest meal. 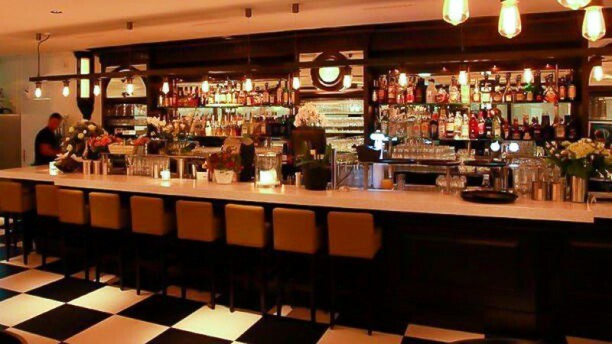 The chairs are made from leather, the floor is black and white checkered and the bar impressive. Nice is that you can order the entire menu throughout the whole day. At the production of biological products the well being of nature, animal and human is taken into account. Weekly they have a new menu, but the vast classic menu will never bore! I often find myself paying this restaurant visit and its time to pay them a compliment and place a revue. I am quite fussy with food as we have a top chef in the family. What's wonderful about Rendez Vous is that they can tailor make anything on the menu. Its never a problem no matter what I ask. The quality of the kitchen is always consistent and of a high quality. I specially come here for the high quality meat dishes, all 100% biological. The atmosphere is relaxed comfy and chic. The staff are great, friendly and efficient. The selection of wine is excellent. meat Thanks for all the happy lunches and dinners.